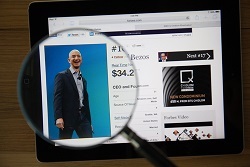 The Amazon stock price received a bullish catalyst on March 19 that you might have missed. It was on a Saturday, so most investors overlooked it. But I wanted to make sure you knew about it now. Barron's listed Amazon.com Inc. (Nasdaq: AMZN) CEO Jeff Bezos as one of its 30 top CEOs for 2016. This is a redemption of sorts for Bezos. He made the list in 2014 but was snubbed in 2015. It turns out Barron's likes Bezos for the same reasons we do, stating that he's "a visionary entrepreneur, he keeps inventing the next big thing." We've long touted Bezos' visionary leadership as one of the Amazon stock price's biggest catalysts. In fact, Bezos' vision allowed him to create a dominant foothold in the next big tech revolution. And this industry is expected to reach $14.4 trillion in sales by 2022. But before I get to that, I have to address the fact that the Amazon stock price is down 17.6% in 2016. And I want to make clear to Money Morning readers why the stock has dipped and where it's headed from here. Wall Street had high expectations for Amazon's Q4 2015 earnings report. Analysts projected earnings per share (EPS) of $1.58 on $35.9 billion in revenue. Bezos' company missed on both estimates, reporting $1.00 in earnings and $35.75 billion in revenue. Amazon's rising operational costs were another concern for shareholders. Operating costs ballooned to $35.6 billion. That was a 24% increase from last year. Shipping costs also climbed 2.5%. It's true that AMZN is down in the short term, but it is still up 47.42% in the last 12 months. During the same time, the Dow Jones Industrial Average is down 2.7%. By 2022, Cisco Systems Inc. (Nasdaq: CSCO) projects the Internet of Things (IoT) market will reach $14.4 trillion in sales. In just four years, research service Statista projects that 50.1 billion devices will be connected to the IoT sector. That's a 118% increase from the 22.9 billion devices expected to be connected in 2016. The Echo is still in its infancy, and its main functions now are to play music, read books aloud, and answer questions. Fitbit Inc. (NYSE: FIT) recently announced a deal with Amazon to integrate the Echo with its fitness-band technology. Fitbit users can now use Echo to tell them how many steps they have taken, data on their sleeping patterns, and how many "active minutes" they've logged each day. Fitbit has also programmed up to 60 statements Echo can respond to, according to Forbes. Ford Motor Co. (NYSE: F), NBC News, Uber, Capital One, and Domino's are all using or planning on using the Echo to connect with customers. From ordering a pizza to catching a ride, the Echo is showcasing the future of how businesses are going to connect with customers. Back at the end of 2015, Money Morning Defense & Tech Specialist Michael A. Robinson listed Amazon as part of his Internet "Dream Team." Robinson believes Bezos identified just how important the Internet of Things and Infrastructure-as-a-Service (IaaS) sectors are going to be for tech companies. If Ford, NBC News, Uber, Capital One, and Domino's built their own technology infrastructure, it could cost hundreds of millions of dollars each. Bezos correctly identified that companies would rather "rent" out Amazon's technology infrastructure than build their own. "Bezos has once again broken ground for another multibillion-dollar web business," stated Robinson. With a growing source of revenue from the IoT and IaaS sectors, Amazon will increase profits and have even more money to pour into innovation and development to further its foothold in emerging markets. Amazon generated $107 billion in revenue in 2015, and analyst estimates from Thomas Financial Network place an average revenue target of $155.21 billion by 2017. That's an increase of 45.06%. Earnings for full-year 2016 are projected to hit $4.59 billion, which will be an increase of 267% from 2015. By 2017, earnings are projected to hit $8.54 billion. That's a gain of 582% from 2015. The Bottom Line: The Amazon stock price is down 17.45% in 2016, but long-term investors should not panic. Barron's picked Amazon CEO Jeff Bezos as one of their top 30 CEOs in 2016. They picked him because of his ability to focus on long-term growth, and Bezos' bet on the $14.4 trillion Internet of Things market is already starting to pay off. I like Amazon and the ideas above. Isn't the PE ratio for AMZN >800? What happens in a recession, crash, …? MM, please comment on this.